If it weren’t for the large Malaysian flag banners flying outside this modest caff, you could easily miss this little gem amidst the hustle bustle of Leceister Square. Despite its seemingly tourist trap location on Charing Cross Road opposite the tube station exit, I do think this is one of the few places in the capital which does Malaysian Street food some justice. You will find the quintessential Kopitiam** favourites on offer here… Teh Tarik, Nasi Lemak, Assam Laksa…even Ice Kacang! I’ve probably been back more than 5 times since the place opened in early ’09 and have worked my way through the Nasi Lemak, Penang Char Koay Teow and Hokkien Mee on various occasions, all of which are usually consistently up to standard and completely nostalgia inducing. 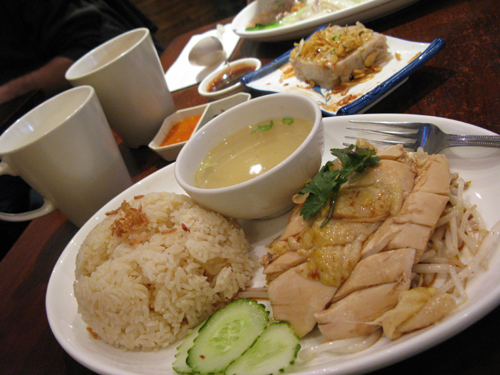 On this particular visit, I avoided the spicier options given I was a little under the weather and stuck to the very reliable Hainanese Chicken Rice. Everything was as it should be… The chicken, tender and moist… steamed to perfection. The rice and broth were both wonderfully fragrant and savoury. And of course the thick soy sauce and garlic chilli paste to accompany, without which the dish would not be complete. 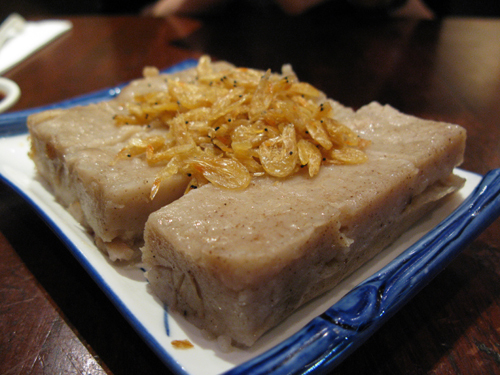 Jo is particularly partial to the Cantonese Style Ho Fun (Wa Tan Hor) here which she has ordered time and time again. The flat, rice-based noodles have that distinctly familiar wok-fried taste and with a generous helping of prawns, squid, and slug of eggy-gravy, its really quite comforting for her noodly cravings. With mains barely £5-£6 at most and many of the home-made specialty drinks under 2 quid, there is always a good excuse to go overboard and order more than you need. I’m usually swayed by two of the less mainstream Malaysian delicacies here which are often difficult to find anywhere else in London. They do Yong Tofu, which despite the Tofu reference is an entire cuisine on its own in Malaysia describing various forms of beancurd and vegetables stuffed with fish paste (usually deep-fried till crispy or poached in a fish broth). However on this occasion, with the bean-curd overly dry from excessive deep-frying and the stuffed Chilli and Aubergine shrunken in size relative to that which we had on our first visit, this was the one thing which didn’t quite make it. The Yam cakes however were lovely and reminiscent of those my mom used to buy from Imbi Road market for breakfast. Topped off with deep-fried crispy shrimp, spring onions and served with a sweet, plum sauce-like dip, it’s a great dish to dig into on the side while waiting for the mains. Yummy. Coming from a country I’m growing increasingly distant from where I’m ashamed to say churches are being set ablaze by extremists, the food at this place is a little reminder of everything that’s good about home. Worth a visit when you’re ever in China Town and not feeling Dim Sum. dont think their yam cake is that good actually..unless we were just unlucky that day. their chay kuay teow is not bad though! 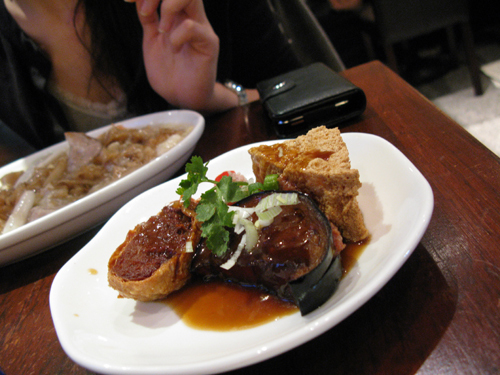 this looks very good, always on the luck out for good places that are not Chinese in Chinatown… and really cheap! Hello! Didn’t realised you’re based in London?! 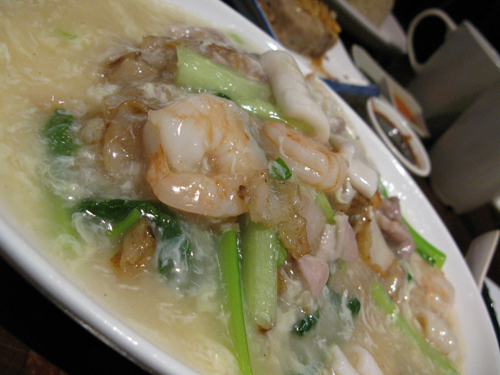 I always go to C&R in Chinatown (Rupert Court) to satisfy my cravings for Wat Than Hor. Thanks for the tip, will check out this M’sian restaurant when I’m in town next.